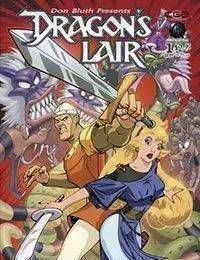 Celebrating the 20th Anniversary of Dragons Lair, the stars of one of the top arcade games in history make their comic book debut! Swearing revenge on Dirk the Daring for killing his offspring, the deadly dragon Singe swoops up Princess Daphne in his razor- sharp claws! Now, armed with his courage and skills, our brave knight must survive the dangers of the Dark Kingdom to save his Princess! Its swordplay, sorcery, dragons, and damsels...plus a pinch of humor! Lead on, adventurer... your quest awaits!